It’s always important to look after your skin, regardless of the weather. But since the sun is shining it’s even more vital to protect your skin from the elements. 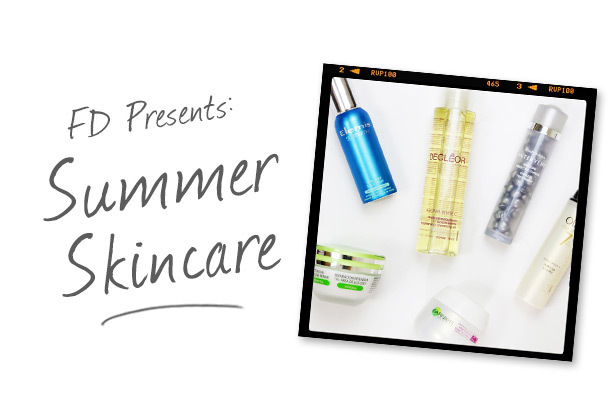 Today, Steph is talking us through her summer skincare routine, and different ways you can improve your own! It’s always important to cleanse the skin to remove both makeup and general dirt that builds up throughout the course of the day. One of the best cleansers on the market right now is the Decleor Cleansing Oil, as it gets rid of all traces of makeup in an instant, and leaves the skin feeling soft and supple. Suffering from spots? The Elemis Tea Tree SOS Spray is here to do just that – Save Our Spots (get it?). Steph likes to apply it to the skin using a wet cotton pad, almost like a toner. The tea tree will help to reduce redness as well as get rid of any infection. For dry skin sufferers it’s always a good idea to use an exfoliator once or twice a week to get rid of any dead skin cells. The Coryse Salome Exfoliating Cream is perfect for doing just that, without irritating the skin! Eye creams are a seriously important part of anyone’s regime, and Steph’s favourite right now has to be the Barielle Intensive Eye Zone Repair. It’s a great budget alternative to any high-end cream and works amazingly well at reducing the look of fine lines. Another really important step is moisturising the skin. For summer, it’s always a good idea to layer on the sun protection, and one moisturiser that ticks both boxes is the Garnier Vital Restore Revitalising Day Cream with SPF. Steph like to apply it before her makeup to act as a great makeup base! Already up to speed with SPF? Another great day cream is the Olay Total Effects Wake up Wonder Moisturiser, that includes 7 skin perfecting steps, including pre minimising technology and anti-fatigue ingredients. It’s another greg makeup primer, but without the flashback. Finally, once you’ve cleansed your skin thoroughly it’s time to apply a treatment. This step is optional, but one sure fire way to leave your skin radiant is to apply the Elizabeth Arden Intervene Skin Tone Perfecting Capsules. They do exactly what they say on the tin, and make for a perfect quick overnight fix. Let us know your skincare secrets in the comments section below!